Hello, my name is Chris Kotsopoulos. I am a retired National Hockey League player. During my NHL career I played for the New York Rangers (once a Ranger, always a Ranger), Hartford Whalers, my hometown Toronto Maple Leafs, and finished off with the Red Wings. During the 2007/2008 hockey season, I was given the opportunity to do the radio color commentary for the Quinnipiac Bobcats University Mens Hockey team in Hamden Connecticut and I am continuing to do so. I am an avid Ranger fan and a die-hard San Francisco 49ers fan. I love to talk hockey and give my opinion. Thank you for taking the time to read this as well as my blog and make sure to check back for updates, site links (located at the bottom of the page), and responses to fans comments! Offseason Review (till this point) 2016. Let’s get this one started with a bang. 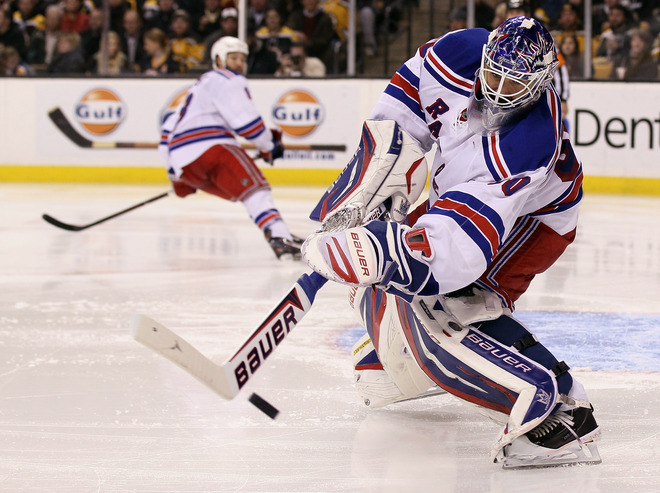 Is there anyone in the league playing their position better New York Ranger goal tender Henrik Lundqvist? I seriously doubt it. First I’ll deal with his own team. With all due respect to the high quality of play by the Ranger team overall this year (A well deserved respect I might add) players like Ryan Callahan, Marion Gaborik, Dan Girardi, MDZ are all having super seasons and you can’t disregard that. Anyone who has watched the Rangers this year knows that Lundqvist has been absolute backbone to this team with his spectacular play. He has, by himself, stole games for the “Boys in Blue”. To me it’s not even close Lundqvist is hands down the MVP of the Rangers team. But I’m going further than that. He in my opinion is the MVP of the league. Just look at the numbers: 42GP-27W-11L-4OTL-75GA-1.77GAA-941SV% and a league leading 7 shut outs. I realize that players like Evgeni Malkin, Steven Stamkos, Pavel Datsyuk, Claude Giroux, and many more are all having great years. Each one in their own way are key to their respective teams and I don‘t discount that. However, not one of the above mentioned or who ever you may feel is deserving in this debate can be counted on as heavily by his team than Lundqvist. In the end there can only be one who stands alone as to who has the greater importance to his team and that my friends is the “King Henrik Lundqvist”. To all Rangers fans and pure hockey fans ask yourself this question… “Where would the Rangers be with out him”? Case closed! As for the Rangers themselves, they are sitting a top of the Eastern Conference Standings with 79 points. There’s lots of hockey to go but I’m beginning to feel like it’s theirs to lose. With 27 games left and 7 point spread over the Boston Bruins. People have been waiting all year to see the Rangers fall and it hasn’t happened and probably won’t. It will be interesting to see what if anything happens at the trade deadline with names like Rick Nash, Jeff Carter, and even Ryan Smyth being thrown around. The Rangers certainly could use a proven scorer and a big shot from the point on the PP. Will anything happen? At what price? and what cost? is the only question…Stay tuned . Some other news around the NHL former team mate of mine in Hartford. Joel Quenneville is apparently under pressure in Chicago. The Blackhawk’s have lost 9 in a row. All of sudden people want to blame Joel? Really? It’s not like he’s forgotten how to coach, But some people want you to believe that. I believe it’s a bunch of crap! How about pointing the fingers at the less than stellar goaltending by Corey Crawford and Ray Emery. As well as the lackluster play by the players during this losing streak. This is on the players, Not the coaching plain and simple. Not a big fan of the Detroit Redwings, but I have got to give them their props for setting an NHL record of 21 straight wins at home. Impressive. They are leading the west at this moment but it will be a dogfight down to the end as Vancouver and San Jose are not going away in the west. Anyhow that will just about do it for this post. Agree to disagree please post your thoughts on the blog itself. I dare you! Also please check out my new website chriskotsopoulos.com I think you will enjoy it! It was built by my son Cody Kotsopoulos of Kotsy’s Designs and what a fantastic job he did! I’ll be away this weekend doing the Quinnipiac Bobcats at RPI game on Friday. Saturday it will be the Bobcats at Union. I’ll doing the game with my play by play partner extraordinaire Bill Schweizer so check us out! One last thing make sure you check out and tune in to the Instigators Hockey show” every Wednesday night 8:30. Over and out!